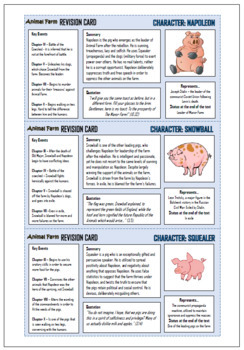 These colourful, comprehensive, and well-structured revision cards have been creatively designed for students securing their understanding of George Orwell’s allegorical novella ‘Animal Farm.’ Each card is visually-appealing and highly-detailed, covering aspects of each feature including a full summary, cited quotations from the play, definitions/ examples, and a consideration of audience reactions. 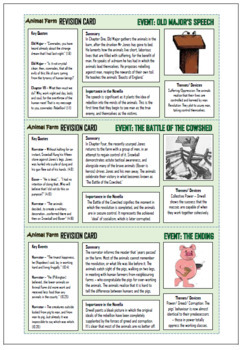 They are tried and tested, with teachers incorporating them in revision games, using them as essay writing aids, or utilising them as home revision aids. They are provided as both PDFs (to prevent formatting issues between computers) and as Word documents (for easy editing). 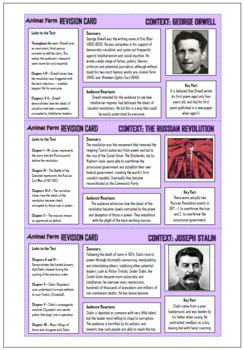 Themes - The Corruption of Socialist Ideals, Naivety, Fate and Religion. 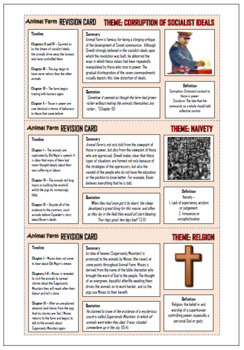 For any questions or comments, please contact TandLGuru@yahoo.co.uk - Many thanks!